There is a castle in Washington State by Bob Nippolt. Nippolt's castle is roughly seven miles from the mouth of the White Salmon River, close to the Columbia Gorge, which is the border between Oregon and Washington State. 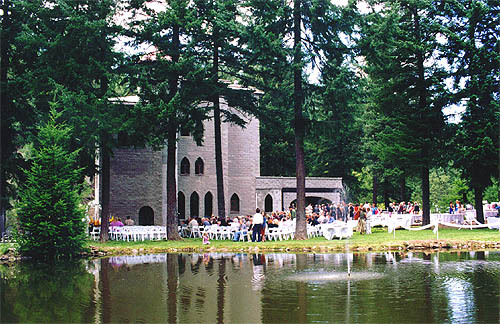 Nippolt began the 4800 square foot castle in 1988. It's four floors high, 65 feet tall. This guy is right. I have been there. Really remote place. You would never know it's there until you get a few hundred feet from it, or drifted down the river. I can't verify the name, but the time frame sounds about right. It was for sale in the late 90's for like $500,000. My parents Realtor showed it to us when they were looking for houses in that area. It is in Husum, WA. Does anyone have more information about this?